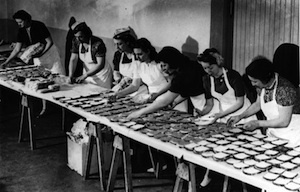 The American 1900s had the Bowery boys; the 1920s, the Bohemians; the 1940s, the zoot suits. Every generation has birthed a subculture of bad boys, with distinctive styles, dialects, and ideologies. The bad boy of the late 1990s, the subject of today's Zoom & Pan, is the mook. Specifically, Tom Green in Freddy Got Fingered (buy it ). Urban Dictionary defines it best: the mook is "an adolescent to twenty-something male who shows off and makes a scene of himself. A mook personifies the adoption of trends for the sake of commercialism and the mindless celebration of childish masculinity." There may be a mook or two in your life, and if so, you are probably well aware of his existence. The high emperor-shaman of the mooks is, indubitably, Tom Green. His body of work in television and film encompasses the genital- and meat-obsessed, irreverent, gross-out comedy aesthetic that characterized the era. All of these bits and pieces converge in a single scene in his debut feature film, Freddy Got Fingered. 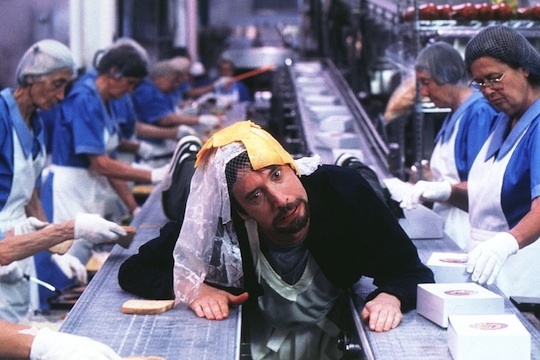 Don't get me wrong, I think that Freddy Got Fingered is a genuinely horrible film. It jumps from one creepy set piece to another, dragging the desiccated corpse of its plot behind it. Green's character is just an extension of his trademark burnout persona, while Rip Torn plays the character's hard-nosed father. That's really all one needs to know. In a movie where a grown man wearing a deer carcass screams, "I'm inside the deer," and a bust of Sigmund Freud is thrown out a window, you know certain filmic conventions won't apply. Freud himself probably wouldn't know whether to sneer at or applaud Green's audacity in this scene: a confrontation between a father and son in a room full of sausages. 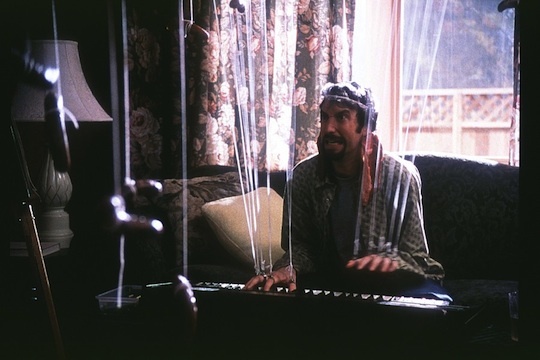 Here, Green sits at a keyboard in a living room where about a dozen or so sausages have been rigged up to his fingers via a pulley system on the ceiling. As he plays his discordant progression on the keyboard, the sausages dance up and down in front of him. Simply put, the scene just screams, "Penises penises penises penises penises!" Green's character blows off his father's disapproval by continuing to play and singing, "Daddy, would you like some sausage?" In response, the father grabs at the meat and destroys the keyboard, and the scene suddenly takes a chilling turn. This depiction of patriarchal violence has echoes throughout the history of literature, from your everyday Lifetime movie to way back in the Old Testament. It resonates deeply in the human psyche, but Green gives it a novel turn. It's not every day that we see dads rampaging at the sight of phallic symbols. Torn's character seizes the son's phalluses, which have become supercharged with meaning up to this point in the scene. Here we see a kind of speaking out against unchecked masculinity, as embodied by the scene being overflowing with phallic symbols. The sausage phalluses are linked to Green literally — by string — but they should also be read as an extension of his psychological self. Patriarchal violence, or unchecked male power, hurts and destroys men, too. Perhaps Green's mook persona is more than just a symptom of late capitalist nurturing: instead, it's a reaction to old-style masculinity, to an adulthood that accepts violence as a facet of daily life. Well, this is certainly one movie that I will not be watching! How could you have watched the entire movie?